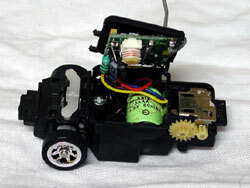 One of the more memorable trends of the last year or so has been mini RC cars. Perhaps the most popular were Tomy's Char-G range and we reviewed one here about a year ago. A whole culture of mini-racing sprung up for a while, and for some of the cars you could even get upgrades such as faster motors and suspension mods. Pretty amazing, when you consider these things are about two inches long. I'll admit they looked kinda cool, but on the steep side of AUD $50 I wasn't that interested. The whole hotting-up-and-racing thing didn't really appeal to me either. A few cheaper copies appeared here and there, but even they were around the $40 mark. Until now! 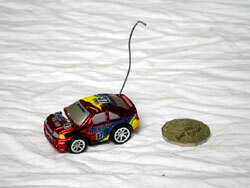 PCRange sent over a little car which seems to be, if it's impolite to say "a cheap knockoff of", at least, "very much inspired by" the more expensive mini-cars. And, it's only $19 AUD! If you buy two, they're only $15 each! Plus shipping, of course. According to the label on the little snowglobe-like container, this is a Shen Qi Wei Super Racing Car. You can't deny it's cute. For international visitors, that odd-looking coin is fifty Australian cents. The car is a smidge under 6cm (or a smidge over 2 inches) long. I'm not much of a car person, so while the anoraks in the crowd are no doubt shouting "It's a Skyline/WRX/BMW/Somethingsomething", I will hesitantly suggest that the lower headlights look a bit Subaru-ish. But the bonnet looks more Skyliney. Perhaps it's just a generic or composite car designed to appeal to fans of all marques. Did I mention I'm not much of a car person? Nice colour tho, isn't it? Pulling the little dome apart and unscrewing the car from the stand reveals that the bottom of the dome is in fact the controller and charger in one. On the bottom is a blue door which opens to expose some electrodes and on the top is a hole to screw in the included antenna. Two AA batteries (not included) go into the back of the controller and these are used to charge the car up as well as power the transmitter. 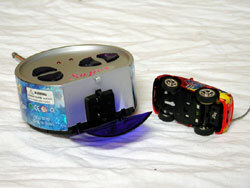 You clip the little car onto the base, wait about 45 seconds and you're charged up for about 5 minutes of play time. I'm assuming the car has a little battery inside, and not a capacitor, because of the way it runs at pretty much full speed for the entire duration of play, and then rather suddenly stops. No gradual reduction in charge as you'd get from a capacitor. Towards the end it does, admittedly, sometimes ignore the fact that you wanted to turn. The play time varies from perhaps 3 to 8 minutes because, of course, everything is powered from the one little battery. So, if you do a lot of steering, or a lot of stopping and starting, or driving over relatively rough-going terrain like carpet, you will chew up the charge quicker. Regardless, in terms of charge time vs play time, this compares spectacularly well to my 1:10 scale "real" electric RC car. That car takes an hour to fast-charge (the occasional overnight slow-charge is good for the batteries) and lasts for about 20 minutes of play. The bigger car also has a nasty habit of smacking into things so hard that it breaks front suspension components regularly. The little car on the other hand seems very robust. I've gone through about 20 or more charges (all in the interests of science, you understand) and driven it on tiles, MDF boards and even the short carpet in my office. During the course of learning to drive it, it has been smacked into countless hard objects at full tilt and even spent an entertaining few minutes as an impromptu soccer ball for Max The Easily Excitable Dog. (He's a border collie. I've seen him try to herd empty garden chairs. A small shiny object zooming across his field of vision stands no chance.) Anyway, apart from some minor chips to the paint it's survived admirably. An all-terrain vehicle it is not. The front wheels are only 12mm high and it only has about 1.5mm of ground clearance, so hard surfaces like wooden floors, tiles etc are best. Even tiles with a few millimetres drop between them will throw the car around as it zooms across them, but it's still mostly controllable. Any kind of vaguely longish carpet you can forget. Dirt outside is probably a bad idea too. Desks, hard floors and short carpet are the go. I couldn't resist pulling the cover off and peering inside. Don't worry, I'm not going to perform a complete autopsy and point out things like the neodymium iron boron magnet - I'll leave that to more qualified people. Besides, I want to be able to put it back together and keep playing with it, and once it's apart there's no guarantee I'll remember where everything went. Inside there's a tiny battery, marked "1/3 AAA 1.2v 80mAh". What that translates to in terms of usability I couldn't tell you, but I will note that you can charge the car, pull it off the charger, and then immediately put it back on again for another charge at least 3 times without it exploding. Well, I could. You're on your own there, of course, and it doesn't make the car any faster, but makes it run a fair bit longer. And maybe explode. I dunno. 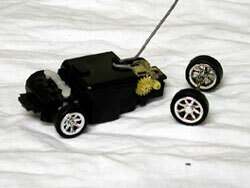 I pulled the rear axle out, which is easy to do - it just pops out. Handy too, because it seems to get gummed up with hair and dog fur and carpet fluff occasionally. You don't need to take it off to get the cover of the car off, they are removed separately. The rear axle is rigidly mounted, but I note that the car has a nod at front suspension, in that one wheel can rise while the other falls. This perhaps is how it unloads the inside rear tyre which helps it turn so quickly on hard surfaces, and will also stop it from bouncing around too uncontrollably on the edges of tiles, etc. It also has a little steering trim on the bottom of the car. If you find the car tends to turn slightly to one side when you want it to go straight, you can adjust the little lever to make it straighten out. 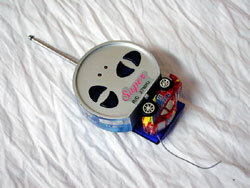 Speaking of turning, this is of course a completely digitally-controlled car. As in, it's not analogue. So, instead of thinking "how far do I want to turn the front wheels? ", you have to think "how long do I want to keep the front wheels at full lock?". Whizzing around at high speed tends therefore to involve lots of rapid jinking-back-and-forth steering movements. But it's very controllable once you've had a bit of practise and there's lots of fun to be had. Here's a video, taken by my Nikon CP990 digicam. There's no sound. It's encoded in quicktime. Any video format zealots who want me to use some other format are more than welcome to buy me a camera that records in it. Two dogs cameo in the film. Guess which one is Max? On the tiles, the car is wheelspinning a lot under power - it's as all-or-nothing as the steering - and in the narrow field of view of the camera I'm not sure if it ever gets up to full speed. I don't know how the speed compares to the more expensive cars, but realistically, much quicker and the car would be uncontrollable. This is a fun toy. Ok, it's a Made In China cheapy, but it does seem to be pretty well made, surving the normal sort of torture these things encounter. The only annoying thing is that the door of the battery compartment on the controller pops open occasionally, which I can live with. There's no upgrade bits for these cars, but there are 3 frequencies available so you can race with 2 mates. For a bit of cheapy fun on a clear bit of floor, they're pretty amazing for $19. Recommended! Thanks to PC Range for providing the review sample. This car reviewed by Dan does seem remarkably similar to the car in this review. The same car? I couldn't tell you. Different names, slightly different finish to the controller and a different shell, but the cars themselves do look extremely similar both inside and out. So, some info in that review may be useful to people who are considering buying the car in this review. However, those ones were a fair bit more expensive and apparently aren't in stock anymore anyway.